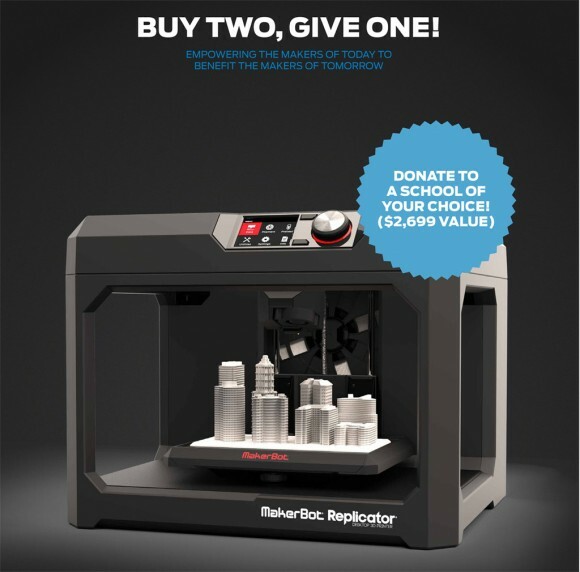 MakerBot is currently running an interesting promotion that allows users buying two fifth generation MakerBot Replicator Desktop 3D printers to give one refurbished 3D printer to a school of their choice. Alternatively a school can purchase two 3D printers and also get a refurbished third one for free as well as the promotion allows for that as well. You can participate in Buy Two, Give One promotion either with a purchase from the official MakerBot website or with one of these partners: Staples, Home Depot, Best Buy, PC/MacMall, VWR, SHI, CDW, B&H, and Dell. Unfortunately it seems that this promotion for purchasing two new MakerBot Replicator Desktop 3D Printers with at least 1-year of MakerCare and donating a refurbished model to the school of your choice is only available in USA.